The sword is not merely a weapon; it is regarded as a sacred item. 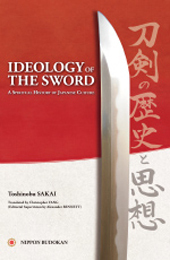 Regarding the idea that the sword is a Japan-specific development, this book will examine its roots in China and Korea to East Asia using reliable historical records as its base. From the analysis of historical documents including the legends recorded in the Kojiki (Records of Ancient Manners) and the Nihon-shoki (Japan’s oldest historical record), books like the Tale of the Heike and the Taiheiki that describe the sword as one of the Three Sacred Treasures, and in the scrolls handed down in the Kashima Shintō-ryū and Jigen-ryū schools of swordsmanship, the originality of the Japanese sword becomes apparent.